Around £1 million is to be spent in Tewkesbury on measures to boost cycling. The bulk of the funding is to go on upgrading the old railway line from Ashchurch into the centre of Tewkesbury as a shared cycle/pedestrian path. There will also be smaller-scale measures to improve links to the residential areas around Tewkesbury, including the reinstatement of the old road from Tredington via Walton Cardiff as a cycle path. The quality of infrastructure to be provided is unclear. The Cheltenham & Tewkesbury Cycling Campaign is concerned that barriers are to be placed across the railway path at road junctions even before there is any evidence that motorcycle abuse may be a problem. Government guidance recommends that barriers should only be used as a last resort. There are also concerns as to whether important factors such as path width and visibility are going to be adequate. The railway path has the potential to be a useful facility, but only if implemented to a high standard. Cheltenham & Tewkesbury Cycling Campaign has been pressing for some time for a proper audit of cycling conditions to be carried out in Tewkesbury before money is spent (and possibly wanted) on ad-hoc facilities. The possibility of an audit remains on the agenda, but funding is a problem. However, more money is going to be available in Tewkesbury from the Highways Agency (to reduce congestion at the motorway junction by encouraging walking, cycling and public transport) and the Dept of Health (to encourage healthy lifestyles), so more money for cycling might be available from these sources. Cheltenham & Tewkesbury Cycling Campaign is involved in continuing discussions with the Highways Agency about a possible partnership to promote cycling. Membership fees are to rise from the New Year to £5 individual, £7 family, £10 affiliate - our first fee increases in around 20 years! More details of developments will appear on this web site soon. From Saturday 11th October, and on the second Saturday of November and December, the public will be able to visit Cheltenham police station at Talbot House, Lansdown Road, to view cycles in order to try and identify their stolen bike. The property department will be on hand between 9 o'clock and 2 o'clock for the victims of cycle theft to view recovered bikes that have been brought in to the station. They will need to bring with them the letter from police received following the report of a theft, and proof of identity in order to be able to view the cycles. This will be run in conjunction with the cycle coding sessions that will move from the first Saturday of the month to the second Saturday. PCSO Kim Graham advises owners of cycles to code their property with an ultra violet pen in order to make it traceable, and to advertise this by putting the sticker supplied in the kit in a visible place on the cycle to act as a deterrent. Details of the bike, including frame number, make, model and any identifying marks should be recorded on the card provided to enable a victim of cycle theft to give the police as much information as possible should they have their bike stolen. Cycles should be locked to the bike racks supplied or to an immovable object with a good quality lock, in an open place and not in quiet, little used alleys where a thief can work undisturbed. The coding kits can be obtained from Cheltenham police station at the coding sessions, and all Town Centre cycle shops issue coding kits on behalf of Gloucestershire Constabulary at the point of sale. Cheltenham police are also advising anyone who keeps their cycle in a shed or garage to be extra vigilant and lock the bikes to an immovable object while in these locations. Remember that the harder you make it for the thief, the less likely you are to have your cycle stolen. 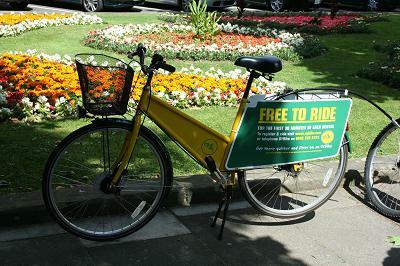 The two-month trial bike hire scheme in Cheltenham was launched on 1st July. See photo feature. A City Bike hire scheme is on trial in Cheltenham during July and August. It uses the yellow hire bikes introduced last April by Gloucestershire University, while the students are off-campus for the summer holiday. The pilot scheme is being promoted jointly by the University, Cheltenham Borough Council, Great Western Trains and Cheltenham Cycle Campaign. The bikes are provided by Oybike and the trial is being managed by Cheltenham Cycle Campaign. 26 yellow bikes are based in 14 docking stations at 7 locations around the town centre. In addition, Great Western Trains is paying for two docking stations with bikes at the railway station. Bikes are released for use by using a mobile phone to obtain a code. The first 30 minutes of each hire is free with longer periods charged to a credit card. The scheme is similar to that operating in Paris on a much larger scale. There are other Oybike schemes in London, Reading and Southampton but none is town wide. The pilot is to determine the market for the scheme, the demand for hire bikes, problems in operating the scheme and channels for its promotion. It will also demonstrate the idea to potential partners and sponsors If successful, the pilot would be expanded throughout the town with a minimum of 100 bikes. The Primary Care Trust is keen to become a partner, using the bikes for cycle training on GP prescription. Funding would come from advertising revenue, hire charges and Cheltenham Borough Council. There is also at least one potential national advertising sponsor. On 16th April 2008, Gloucestershire University launched a bike hire scheme for students at its three Cheltenham campuses. Run by On Yer Bike - a cycle hire company already active in London and other towns - the hire bikes are booked by university students or staff using a mobile phone. Users are given a security code with which to unlock a bike from one of several docking stations. University of Gloucestershire Vice-Chancellor, Prof Patricia Broadfoot, was one of the first to take a bike for a spin. "The bikes are a wonderful addition and the scheme will be of real benefit to us," she said. "I've been keen on getting more staff and students cycling ever since I arrived. It helps us to live up to our ambitions of caring for the environment and cutting down on motorised travel. There's also the added benefit of keeping fit, so it has to be a good scheme." Cheltenham Cycle Campaign has also welcomed the project. Students are given a copy of the Campaign's Cheltenham Cycle Map to find their way round town. It is hoped that the scheme may expand beyond the university and be available to residents of Cheltenham and to visitors. The scheme could also be a boon in providing a pool of bikes for use by people who are interested in cycle training but don't have their own bike.